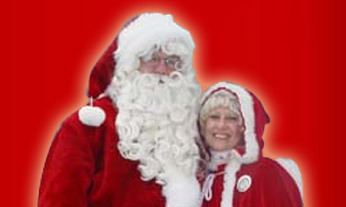 The Christmas in Ida Festival is a division of the Ida Civic Club and is a community based event. 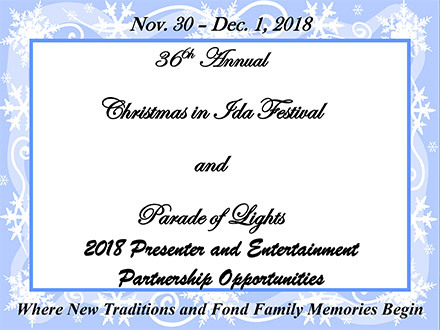 Please accept this invitation to become a Partner of the 36th Annual Christmas in Ida Festival. Celebrating over three decades of family entertainment that has become a Midwest destination and hosting 52,000 visitors. To provide maximum marketing benefits, we offer many opportunities to become a presenting partner that will showcase your company in an event title or an entertainment partner. Partnership packages offer over 18 million potential media contacts through television, radio, magazines, social media and includes a table in the partners tent, which is warm, open, festive, and generates high visitor traffic all day. All of our programs can be designed to meet your marketing and financial needs. The festival will present the Christmas in Ida Family Concert Series with National headliner artists featuring the Country Music Concert and the Young Country Concert. The Commemorative Concert kicks off the festival on Friday night presenting National performers. The wholesome family concerts are produced professionally and In keeping with tradition all concerts and entertainment is free. The Christmas in Ida Festival is a member of the Monroe County Community Foundation. Contributions that are made through the Foundation will qualify as a charitable contribution as a 501 (c) (3) organization and receive full income tax credits. The 2017 festival was a wonderful success that broke all attendance records and received great accolades from participating partners. I hope you can join us at the 36th Annual Christmas in Ida Festival and Parade of Lights, where new traditions and fond family memories begin. Click here to download our 2018 Presenter and Entertainment Partner Opportunities package.